Here's a quick, super comfortable and convenient way to perform a deep cleansing soak. 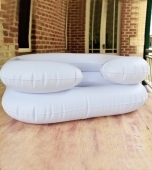 The inflatable basin is approximately 60cm x 50cm and comes with a drain pipe. It holds 10Lts of water but you need to allow for the volume which your dreadlocks will take up so adjust the amount of water you place in the basin accordingly. 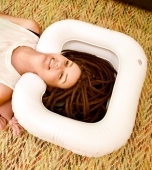 A pillow or yoga block may help to prop your neck up and not put too much pressure on the wall of the basin. This will avoid water spilling over the edge.